Shaun Livingston had an outstanding game against the Los Angeles Clippers, registering 19 points and 10 assists. Then the sight that no NBA fan wanted to see; Livingston on the floor, clutching at his leg. It brought back memories of the horrendous injury Livingston suffered while playing with the Clippers. Thankfully he was able to get up this time around. Livingston will miss 4-6 weeks with a Severe Right Ankle Sprain. It’s not the greatest news for the Sonics or Livingston, but he will at least be back on the court within a couple of months. Livingston’s injury - along with the toe injury of Patty Mills – saw David Stockton receive his first career start in the NBA against the Golden State Warriors. The Sonics performed admirably, but were ultimately outmuscled in the second half of the game. The Sonics had to earn their second win of the season on the road, as they tallied a 101-94 win against the Portland Trail Blazers. 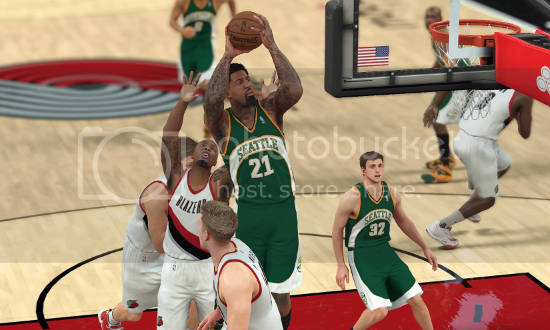 The Sonics had 6 players in double figures, led by Wilson Chandler who scored 26. Andrew Nicholson added 13 points, while David Stockton had his first career double-double with 11 points and 10 assists. Boban Marjanovic (10 rebounds), Andrew Bogut (11 rebounds) and Vince Carter all scored 10 points each. In contrast to the Sonics shared effort, Damian Lillard (46) and Pat Connaughton (19) did the bulk of the Blazers’ scoring. 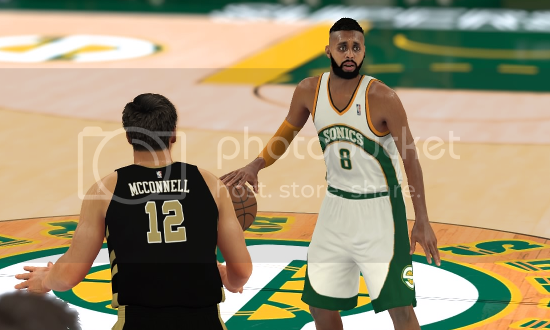 After the Blazers game, the Sonics went back home to face the Barons for the first time. Despite a great return from Patty Mills (24 points, 9 assists), the Barons ran away with the game in the 4th quarter and came away with the first win of the matchup. It was a similar story against the Timberwolves in Minnesota. Mills led the way again with 26 points and 8 assists, but the Timberwolves – and Andrew Wiggins in particular - were simply too strong in the 4th. Despite only two wins in the last ten games, things appear to be picking up for the Sonics. They appear to have an offensive leader emerging in Patrick Mills, and consistent performers in Andrew Bogut and Wilson Chandler. All the Sonics need is more consistency from the rest of the team and better luck on the injury front. Stay patient Sonics fans – wins are just around the corner! The tough start continues, but at least you're having fun with the team. Unlucky break with Livingston, but as you noted, we've seen a much more gruesome injury with him. Good to see Mills still thrills and pays bills! Those jerseys look great btw. They are a nice contrast to all of the red and blue uniforms in the NBA. Andrew wrote: The tough start continues, but at least you're having fun with the team. Unlucky break with Livingston, but as you noted, we've seen a much more gruesome injury with him. Good to see Mills still thrills and pays bills! I think most of the fun has been from the fact that the team is fully mine. 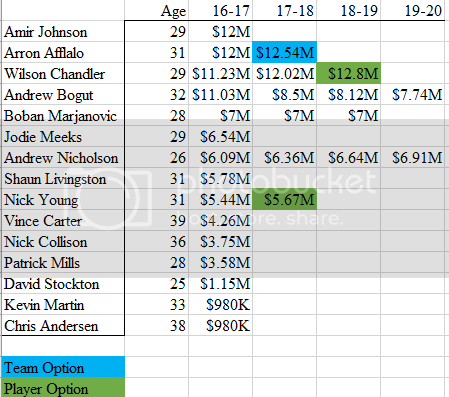 There are no bad contracts (yet) or players I don't particularly like. I guess that's the great thing about expansion. The Sonics have some of my favourite jerseys of all time... might be because my favourite colour is green, but from memory, they've never had a misstep when it comes to their branding. The Sonics registered their first home win of the season with a 128-110 victory over the Toronto Raptors. David Stockton (22 points, 6 assists) and Andrew Nicholson (21 points, 8 rebounds) were the unlikely heroes off the bench in the blowout win, while Patty Mills continued his stellar form with 21 points and 10 assists. However, the main drama came from the thriller against the Memphis Grizzlies. With the team down by 1, the Sonics needed a hero. Would it be Patrick Mills (30 points) or Arron Afflalo (20 points)? You guessed it; it was Boban Marjanovic. Marjanovic ended up with 14 points and 12 rebounds on the night. Kevin Martin also had one of his better games with the Sonics, with 14 points off 5-8 shooting. For the Grizzlies, Chandler Parsons (22), Wade Baldwin (21) and Marc Gasol (20 points, 10 rebounds) were the main contributors. After two season-defining wins, the Sonics had a letdown against the Lakers. Jordan Clarkson (21 points, 7 rebounds, 9 assists), Lou Williams (19) and Brandon Ingram (16) proved to be too dynamic on the night, as the Lakers came away with an unlikely 110-103 win against the in-form Sonics. For the Sonics, Arron Afflalo led the way with 26 points. Boban Marjanovic carried on his game-winning form from the previous game with 17 point and 9 rebounds. Patrick Mills (15), Wilson Chandler (13) and Andrew Nicholson (10) also had meaningful contributions on the offensive end. The Sonics had another dramatic game, this time against the Detroit Pistons. The Sonics won 127-120 in OT. Boban Marjanovic came up huge again with 20 points, 9 rebounds and 3 blocks – but it was Andrew Nicholson who proved to be the clutch man on the night. Nicholson’s incredible play in the 4th and the overtime period saw him come away with 14 points off 6-7 shooting. It was a great team performance by the Sonics, as 8 players came away with double digits on the night. Along with Marjanovic and Nicholson, Arron Afflalo (22), Vince Carter (17), Jodie Meeks (12), Kevin Martin (11), Wilson Chandler (11) and Patrick Mills (10) also had meaningful contributions. 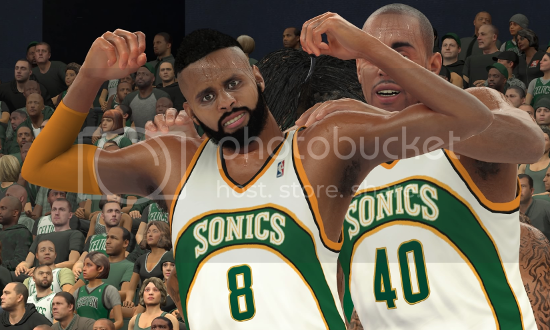 The Sonics carried their winning momentum into the game against the Celtics, as they came away with a 111-106 win. Patrick Mills dominated the game with 36 points (10-18) and 7 assists. Boban Marjanovic and David Stockton both scored 13 each off the bench, while Arron Afflalo and Wilson Chandler added 10 each. It was an entertaining shootout between two of the smaller point guards in the league, with Isaiah Thomas also having a big night for the Celtics. He ended up with 30 points (12-23) and 13 assists. You are surprisingly competitive even in the West so far, didn't see that coming! Who needs a big name on your roster like Stokes or Joel Anthony when you have Nicholson. I love Bogut as number 1! The Real Badger wrote: Why not tanking, man? That's probably the best strategy, but having fun with the mode is the priority. Who knows, I might sim a few games at some point and that might end up tanking the season for me. Valor wrote: You are surprisingly competitive even in the West so far, didn't see that coming! As Chuck says: I like my team! mp3 wrote: Who needs a big name on your roster like Stokes or Joel Anthony when you have Nicholson. Fresh8 wrote: I love Bogut as number 1! After winning their last two games, the Sonics appeared confident heading into their game against the Lakers. They started well, taking a 49-43 lead into half-time, but the Lakers outscored the Sonics 34-20 in the 3rd quarter and eventually went on to win 102-91. Brandon Ingram led the Lakers with 16 points, but it was Jordan Clarkson’s double-double of 15 points and 15 assists that proved to be the game breaker for the Lakers. The Sonics had 5 double-digit scorers on the night, led by Arron Afflalo with 20. However, the other Sonics backcourt players struggled, as Jodie Meeks (6-14) and Patrick Mills (2-13) both had off nights for their respective efforts of 13 and 12. Andrew Bogut (11 points, 9 rebounds, 6 blocks) and Vince Carter (10) both had meaningful contributions, but the damage had already been done. After the Lakers loss, the Sonics took part in easily the best game of the season so far. Unfortunately, it also ended in a loss. 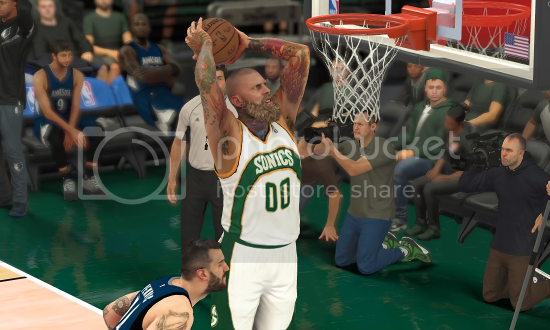 The Sonics pushed the Memphis Grizzlies to 4 – that’s right, 4 – overtime period, before eventually going down 157-154. Mike Conley led the way for the Grizzlies with a career-high 37 points. Zach Randolph (27 points, 13 rebounds) and Chandler Parsons (24 points, 7 rebounds) were also strong for the Grizzlies, while Marc Gasol (18 points, 8 rebounds), Tony Allen (13), James Ennis (10) and Troy Daniels (10) also had meaningful contributions. For the Sonics, Arron Afflalo led the way with 39 points off 14-29 shooting. Patrick Mills (23) and Jodie Meeks (21) were also strong, while Andrew Bogut held his own in the paint with 16 points and 20 rebounds. Vince Carter (12), David Stockton (11 points, 12 assists) and Nick Collison (11) were also pivotal in Seattle pushing Memphis to 4 overtime periods. The Sonics-Grizzlies matchup is developing into one of the better rivalries in the league, as this game followed the previous encounter between the two teams where Boban Marjanovic hit the game-winning shot. 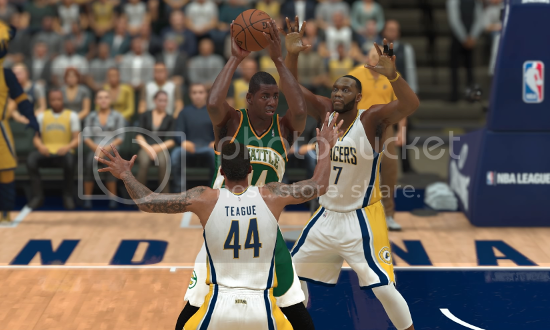 The Sonics managed to get back to winning ways with a 113-103 victory over the Utah Jazz. Mills led the way on offence with 24 points and 8 assists. However, it was Boban Marjanovic’s performance off the bench that was deemed the best of the game. The massive Serbian filled the stat sheet with 19 points, 13 rebounds, 3 assists, 3 steals and 5 blocks – including one overzealous swat against Gordon Hayward. Arron Afflalo and Wilson Chandler were also effective on the night, scoring 18 points each. For the Jazz, George Hill led the way with 28 points, while Rodney Hood tallied 20 points and 5 assists. Gordon Hayward tallied 19 points and Alec Burks added 11. One of the players who really emerged over the last 5 games was Nick Young. 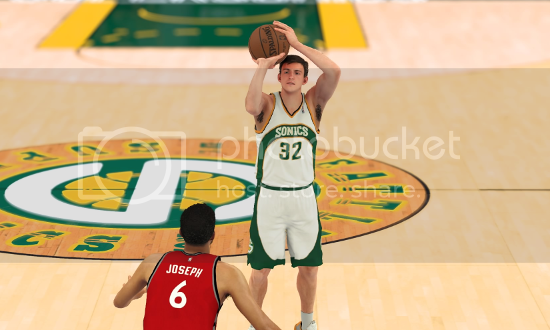 With the game in the balance against the Wizards, Young exploded for 24 points from 12 minutes off the bench to ultimately lead the Sonics to a massive 131-96 victory. 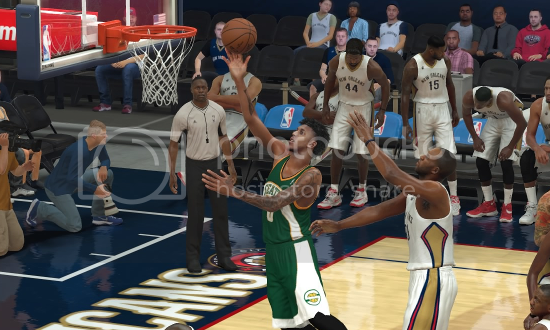 His form carried over to the game in New Orleans, as he and Patrick Mills dismantled the Pelicans 134-89. Young led all scorers with 33 points from 18 minutes, while Mills had 22 points, 5 assists and 5 steals. With consistency being a big issue for Nick Young over the course of his career, it’s hard to say whether he can keep up this incredible momentum. In any case, the last 2 games proved that he can be one of the deadliest scorers in the league when it’s his night. You're doing really well so far. How are Baltimore doing in comparison? I'd say having a near .500 record as an expansion team is definitely exceeding expectations. 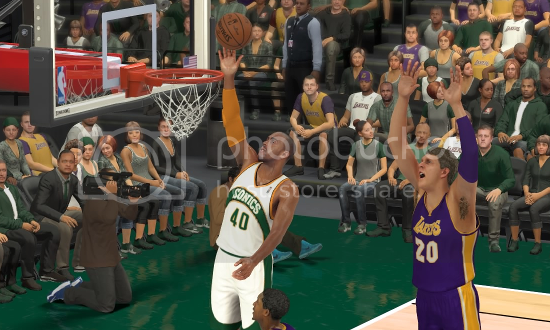 That 4OT loss to the Grizzlies must have been heartbreaking, did you play or sim that one? Things are certainly starting to click, it would seem. Perhaps the Bulls' 50 year old record of the best win-loss record by an expansion team will fall? That Memphis game seems epic, must've been gutted to lose after all that though. 4 overtimes?! Was that a played game? What a steal getting Bogie with number 1 pick! I had it written down on a post-it somewhere, but I did that a while ago. From memory, there were close to .500, so they were doing surprisingly well too. Axel. wrote: I'd say having a near .500 record as an expansion team is definitely exceeding expectations. 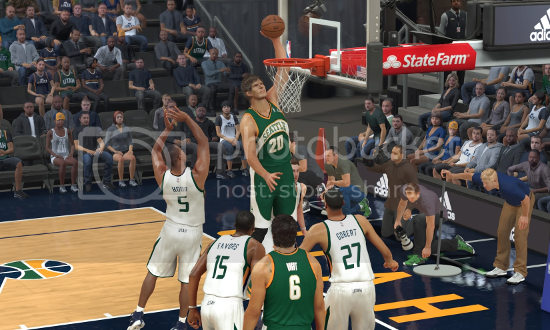 That 4OT loss to the Grizzlies must have been heartbreaking, did you play or sim that one? Lamrock wrote: 4 overtimes?! Was that a played game? I've played every game so far, so yeah, it was a played game. And it was a very frustrating one. Had many chances to win it, but I just couldn't get it done. mp3 wrote: Damm... that block!! I don't think you could ever recover from something like that. Andrew wrote: Things are certainly starting to click, it would seem. 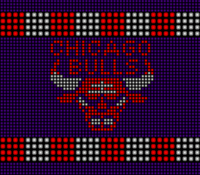 Perhaps the Bulls' 50 year old record of the best win-loss record by an expansion team will fall? We shall see. I definitely think I have the roster for it. Though, I might be a bit rusty for a while with all the MyCAREER and 2K PRO-AM I've been playing. Valor wrote: That Memphis game seems epic, must've been gutted to lose after all that though. I know. As I've been saying, he can be a good impact guy when used sparingly. So far he's exceeded expectations and I'm hoping I can overachieve with him a little while longer. His stupid athleticism and good shot release all help. 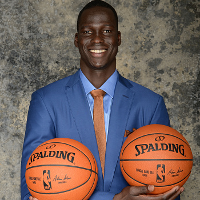 The X wrote: What a steal getting Bogie with number 1 pick! Yeah, I'm still surprised he was unprotected. Definitely a massive steal. 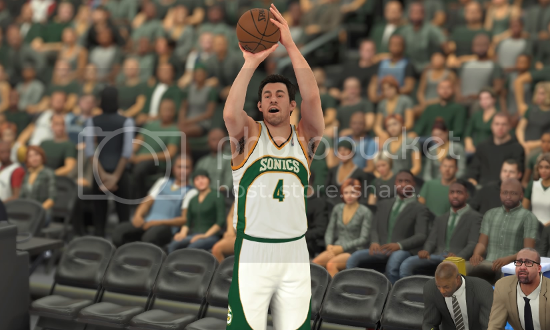 Despite a 38-25 fourth quarter in the Clippers’ favour, the Sonics were able to come away with a 113-111 win. Arron Afflalo led the scoring for the Sonics with 22 points. Patrick Mills and Nick Young both added 18, while Andrew Nicholson was also strong with 16 points and 8 rebounds off the bench. Andrew Bogut added 14 points. After an impressive performance against the Clippers, Andrew Nicholson was rewarded with a start at the power forward position; and he didn’t disappoint. Nicholson was a standout player in the Sonics 107-90 blowout of the Memphis Grizzlies. He had 20 points and 11 rebounds in his first start of the season. However, Nicholson’s best game was in the 126-108 win against the Indiana Pacer. He became the first player since the Sonics re-emerged to register a triple-double, with 28 points, 11 rebounds and 10 assists. That wasn’t the end of the great run by Seattle’s latest star, though. In the 120-93 win against the Lakers, Nicholson – along with Arron Afflalo - top scored for the Sonics with 24 points. He was also able to grab 11 rebounds on the night as well. Even though it was expected that Amir Johnson would be the eventual starting power forward when he returns from injury, Andrew Nicholson is making one hell of a case. Will he be able to keep the spot? Unfortunately for the Sonics, all good things must come to an end. Andrew Wiggins (26) and Karl-Anthony Towns (20 points, 11 rebounds) were too dominant for the Sonics in the Timberwolves 113-93 victory. Nick Young (23) and Andrew Nicholson (22 points, 10 rebounds) led the way for the Sonics, with Patrick Mills and Chris Andersen adding minor contributions with 13 and 11 respectively. 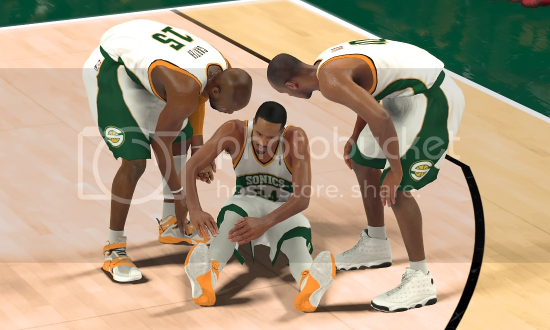 To make matters even worse for the Sonics, Patrick Mills twisted his ankle after attempting a three-point shot. He is likely to miss 1-2 weeks. This latest injury will test the Sonics point guard rotation once again. However, with Shaun Livingston likely to return from injury in the next few games, hopefully help is on the way. Andrew Bogut signed a contract extension with the Seattle Supersonics that will likely take him to the end of his career. After this season, Bogut will be under contract with the Sonics for an additional 3 years at $24.36M. The 32-year-old centre is the first player on the Sonics squad to express interest in a contract extension. 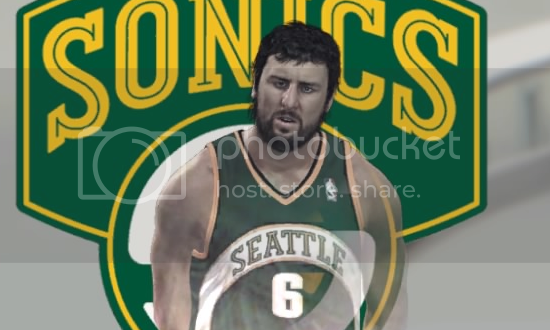 In the current season, Bogut has played every game for the Sonics, averaging 9.9 points, 10.1 rebounds and 2.3 blocks per game. Your off-season should be fun with all that cap room. Lotta cap space. You gonna try to bring KD back to Seattle?